So the first thing we wanted to do is get some of that professional reflective stuff put on on the outside. One of the rooms gets really hot and no amount of crepe myrtle outside seems to be able to block the heat in the middle of the day. Of course, that requires actually contacting someone and we’re still waiting for our bathroom flooring to show up. [update: they came, see last Monday’s post] Redoing the indoors doesn’t require talking to anybody or waiting for anything, so that’s what we started with instead. We tried going without anything on the top half circles for a few days. It was hot and occasionally blinding. Other viable options we explored were Faux stained glass film and plantation shutters. We’ve looked into less expensive options like paper fans and turning regular paper blinds into half circle blinds… but none of them seemed worth it to us. (The more crafty among you may disagree!) Here’s a pinterest page with all sorts of stuff. 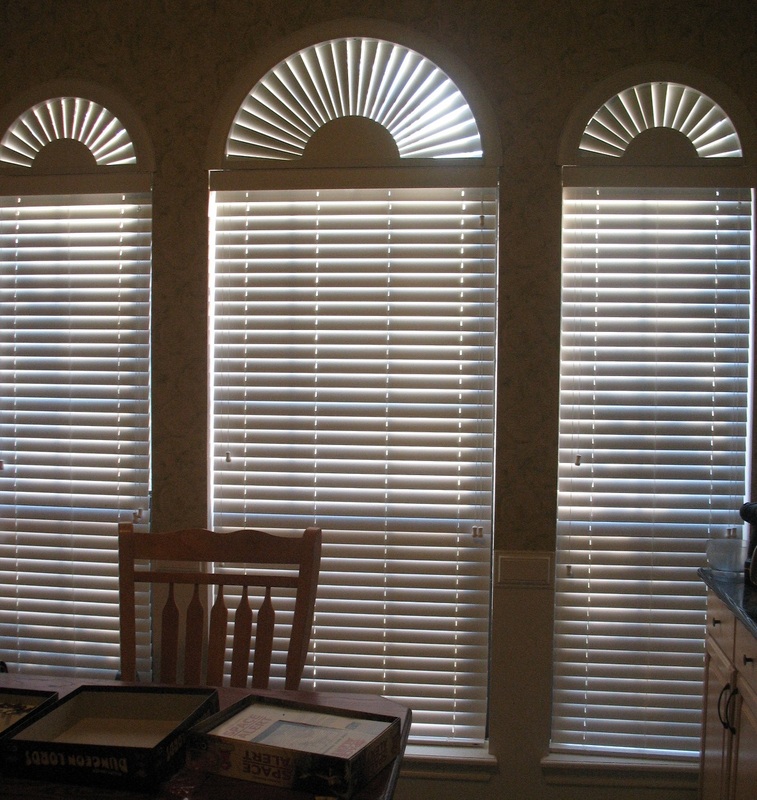 In the end, we chose Bali half circle faux wood blinds in coconut, with matching 2 in horizontal blinds. Cost: $108 for each small half circle and $160 for each small one. Total cost: $752. Then there was a 20% discount (down to $602) and tax and stuff. The blinds were: $67 each for the 4 little ones and $96 for the 2 big ones, $460 total. DH decided he liked the smooth finish better than the fake wood-grain finish. I’m good with that. Total cost including everything: $1050. So a lot less expensive than roman blinds would have been, and I think roman blinds are kinda going out of style, so dodged that bullet. Laziness for the win! We still have the great room, and for that I really want to do something I recently saw at an upscale hotel, but I haven’t been able to find pictures of what I’m thinking of– perhaps it isn’t trendy enough yet. Basically they had a rich grey thick outer curtain, a satiny translucent inner curtain, and a third white blackout curtain. There was a nice grey rectangular valence over the top. All curtains were openable with their own chains. I can’t for the life of me figure out how to go about buying that kind of set-up without hiring someone or picking and choosing the separate parts through several different stores. That kind of set up, especially with being able to open the curtains via chain, seems not to be available as a set anywhere, even though I would like to be able to just press a “buy this look” button and put in my particulars. I think we’ll also replace the vertical blinds in the guest bedroom with a blackout curtain one of these years. We’ll see. My MIL got curtains to replace the blinds, but we didn’t take the blinds down because they didn’t block enough light even if they do look nice. Something we noted when buying– the cheapest options on almost any site have a ton of reviews but some of the reviews say things like “blinds melted after two weeks.” The more expensive options don’t have as many reviews and some don’t have any reviews, but they often tend not to have any negative reviews if they have reviews at all. We rely pretty heavily on online reviews, which we believe have increased our quality of life in many areas (allowing us to pay extra for quality and to avoid hassle with returns). So even if the most expensive options might be perfect and we might be willing to pay that amount if the quality is higher, if we have no information on the quality, we’ll go with the option that has 60-odd 5 and 4 star reviews over the option with 12 (or 2) 5 star reviews. (And we’ll pick that over the 900 reviews where 5%, all from the South and Southwest, note that the blinds melt in direct sunlight.) One of the online places we looked at didn’t have any negative reviews for even their cheapest blinds, so we really didn’t trust them. Boy do we hate this sort of thing. Why can’t stuff just last forever? Or why can’t we have someone who loves to do interior design as a hobby pick stuff out for us? I kept going, “You know, DH, we could just hire this blinds company to pick everything out for us.” But… we still have to *pick* a company, and if we’re going to do that, we might as well just pick the blinds instead. So we did. Shhh – don’t tell anyone, but I usually let my mother organise all our major interior decor purchases (e.g. curtains, blinds, house re-paints etc) this is due in combination because she’s always right & I can’t care enough to argue and because, well, she’s always right and I like the end result. Plus, she can MAKE curtains. However Even she can’t figure out what to do about the ranch slider entry into our kitchen which is our main entry into the house. (Only strangers use the front door) Luckily the kitchen/living faces east so doesn’t get hot afternoon sun. Therefore we may never do anything. My MIL picked out the roman blinds option, but they were way too expensive! I get my own lack of caring from my parents. Like a sliding glass door? Growing up, we had one, and my mom just put up a big curtain rod and thick curtains that were still easy to use. We had nice denim ones that could be washed. Beautiful! I think you made a great choice. I’m terrible at decorating. I haven’t even hung pictures in my apartment in two years since I just haven’t taken the time to do anything. Thanks! We only have pictures at all because we had to stage the house a few years back. My MIL has always done our decorating. She likes to do it to “help” and truthfully she has a pretty good eye. My only suggestion would be to ask someone whose decorating you like to give you suggestions – either for what/where to buy or who to hire. Seems like people who take the time and effort to decorate generally like that kind of stuff so they’d be happy to offer opinions. I wish we had more friends who are really into decorating (or who have SAH spouses who are really into decorating)! We do get contractor recommendations from friends, but that’s not quite the same. Window treatments are so expensive! The house we are living in now came with these wood-look blinds on every single window and I’m just going to keep them. It would be too expensive to replace them all. One thing that saves me money in décor is the fact that I hate clutter. Other than a few pieces I’ve had forever, I’m just not that into home décor. Wood look blinds beat vertical blinds! I like your new window treatments. They look neater and seem to block the light better. High five! I can’t believe that some blinds melt in the south. Yikes! Heh, “buy this look.” Someone could get rich creating a company that can do that (including, ideally, making house calls). For window treatments, I just do what you do–look around, read reviews, ask people. I do find it really hard to find what works because so many people like to review on looks only (or worse, how fast the delivery was or something). I want to know about durability and also about usability issues–I break glasses on granite countertops but not laminate ones, tile floors in the bathroom get slippery but not vinyl ones, etc. What I really want is a show room full of old things that have been in use for thirty years. By renters or people with kids and dogs or something, not OCD designer types. If you can find something relevant on Apartment Therapy, the comments there are awesome. There are plenty of places that will make house calls– the trick is doing it without making a house call! The problem with things that last is that they often aren’t made today how they were made 30 years ago. You can see that on Land’s End reviews a lot– they used to have higher quality. Amen to that on Land’s End. Sigh. Oh, gosh. We have gone way, way, way low end on window treatments. We live back on a treed lot, so while the paucity certainly leaves us neither fully invisible nor fully cool (in a climate-control sense), it’s close enough. When we’ve remodeled I’ve tried to go with blinds-between-the-glass as these are phenomenally easy and never get dirty, but they are surprisingly hard to get (i.e. available in surprisingly few sizes/styles of windows). Everything else we have purchased has been either a cheap vinyl miniblind or a cheap fabric curtain. Very low investment, so very low mental effort. Other stuff? Gosh. I’ve learned I like our home to be light, light, light, so we go almost exclusively with pale, warmish shades of paint (what my stepdaughter derisively calls “oatmeal”) and only play around occasionally with an accent on the trim, and the other firmly guiding principle is doesn’t-show-dirt/easy-to-clean. If we ever get the house repainted (which we need to do), we’ll go for “ubiquitous beige” which is the neutral color that all the new houses have– market research (that I read somewhere probably on the internet) says women prefer slightly pinker, but men react negatively to that, so beige. I don’t think that’s the technical name though. Those look great. Infinitely better than the vertical blinds. The windows actually look taller with the horizontal blinds! I love it! 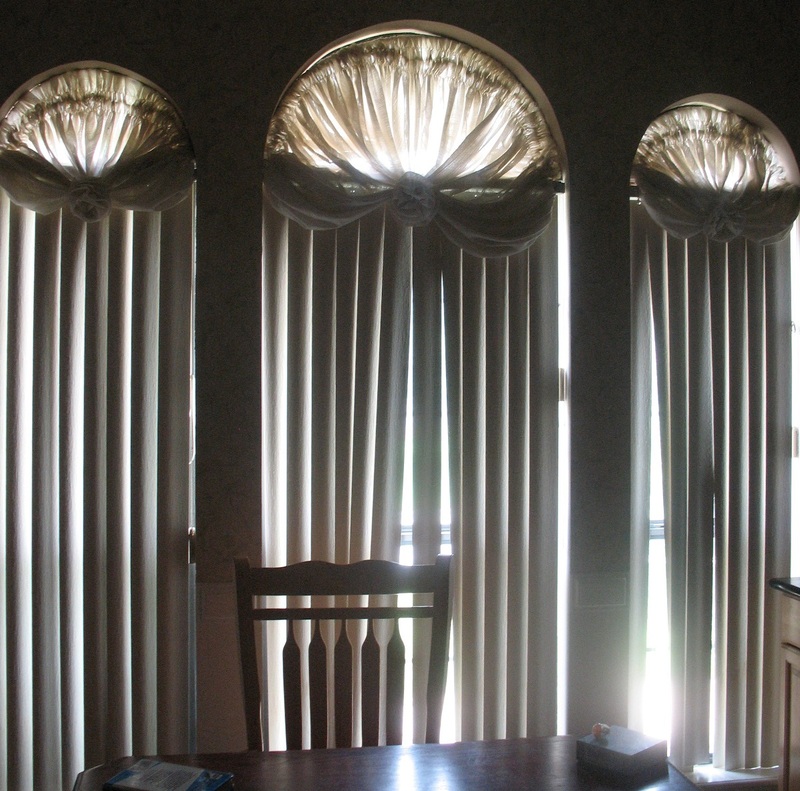 My parents had a half-circle window and they ended up getting custom blinds for the half-circle that were actually horizontal. I like your circle blinds better though. I find it pretty hilarious that some of the blinds melt! More of your mortgage payment goes to principal than my entire mortgage payment! They are tall windows! We’ve seen the horizontal custom blinds, but like the starburst or whatever this version is called better. I really like the new looks. Clean and simple. But, I’m not into anything frilly/poufy and hate any except the most simple solid colored IKEA black-out curtains. The new window treatments do look fantastic. Congrats on another home improvement success! I don’t have the natural inclination to decorate. Since I don’t watch the pay channels like HGTV that propagate the culture of “decorating,” either, I’m not aware of how I’m lacking in this area until and unless I visit a home that is decorated a lot. So much of it seems like too much fuss and waste to me, too. How I’ve handled home improvement projects over the years has varied. With my ex, we tended to do a lot of the “decorating” stuff (like painting rooms) ourselves. Window treatments were outsourced back then, though, since we were getting custom stuff and the measuring and installing was part of the package. When we remodeled a bathroom, we hired a crew to do the work, yet tracked down the supplies ourselves. (So I guess we were sort of acting like contractors and designers there). It was a lot of work. When the kitchen was remodeled, I hired a kitchen designer. I’m glad I did because she put together a floor plan that has worked really well and knew all these details about how much clearance was needed for the oven door to open and so forth that I just wouldn’t have thought of. She also helped me find good suppliers and contractors. One thing I really appreciate having money for is to hire good consultants. Hiring people to advise and either suggest how to go about doing something or track down the details for me really helps me feel assured. The kitchen designer wasn’t terribly expensive, actually, and she really provided good value. I know some of the big home improvement stores will use their software to do layouts based on your measurements, but I wasn’t sure I would measure accurately. And her experience around materials and functional considerations for layout really helped. If 30K is a small budget, we may never remodel the kitchen! We’ll probably stick to getting rid of the gingham wallpaper and repainting the cabinets. Surely that can’t be so very expensive. Last time I priced out replacing the countertops that was still less than 10K. 30k in the midwest will get you a totally new kitchen with a redesigned floorplan, all new cabinets, and all new appliances. My in-laws just redid their kitchen in southern Iowa and spent somewhere around $25k, I think, and they did some really nice stuff with their kitchen. Obviously, the price tag depends on finishes. It’d be worth getting out a designer to improve your flow and see what various price points can get you. If you don’t want granite or stainless steel or a french door fridge or anything fancy, your price tag will go lower. My inlaws did stainless steel with high end appliances and a corian countertop. They also knocked out some walls. Try going to a local cabinet store and just asking. A lot of stores work with designers or people who can help you with layout. A kitchen with functional cabs is so nice. I know time is an issue with you, but it doesn’t hurt to get a bid or two and see what your options are. If it’s 10k for painting and new counters but 20k for a whole new layout, is that worth the money for you? Huh, I don’t know if we even have a local cabinet store. We do have a home depot… and there’s local builders, but the best builder in town also designed our original kitchen (which looks nice, but in reality doesn’t have a great triangle). My sister did redo her kitchen recently and it’s nice, so maybe the people in her city know people in our town. It’s probably worth 20K for a whole new layout, but we’re also likely to keep putting that decision off forever. :( We do have to do something about the wallpaper though because magic eraser isn’t cutting it with DC2’s artwork + spaghetti stains. Not that I’m trying to hijack your thread, but the scope of my project was pretty big. I had a kitchen that was essentially laid out in the 1950s and appliances that were nearly 20 years old (and barely functioning) I was replacing. The remodel consisted of: replacing the refrigerator and range (which also involved running a gas line into the kitchen); adding a dishwasher; adding a garbage disposal; replacing the sink and fixtures; rewiring the kitchen; replacing the floor (from sheet linoleum to hardwood); replacing two windows (and re-configuring the size of one window, which involved bricking up part of the wall outside and patching the inside); adding new cabinetry (I re-used most of the cabinets, but had some new ones constructed to match and fill in the new floor plan); installing a new solid surface countertop (not Corian, but comparable); adding under cabinet lights and wire molds (continuous strips for power underneath the cabinets); installing a tile backsplash; installing a new overhead light; painting the kitchen. I choose very good (but not top of the range) appliances and good labor is not cheap in Chicago. At one point my kitchen was basically bare walls and an open floor. That was a lot of work, and I think managing to get it all done for $30k was very good. That does sound like a lot! 1. replace the countertops, put in a gas stovetop (we have gas hookup already), replace the sink, remove the wallpaper, repaint, and if we’re feeling really adventurous, replace the knobs on things with stuff that doesn’t match the current gingham wallpaper and take out the ice machine we don’t use and replace it with a cabinet. 2. Get someone to redesign the triangle, which I suspect means moving the island just a little bit towards the informal dining nook. Or maybe getting rid of the island and the bar area or moving it or something, I dunno, or putting a sink in the island… but if we do that, then we have to re-tile the floor and maybe the informal dining and the great room. I dunno. For that part we’d need a designer. And then after all of that do all the things in #1 too. If I can chime in here, most people who sell cabinets, will also design your kitchen for you. The first kitchen I designed, I had 3 different people come out, measure and quote. I asked each of them what we would do if it were their kitchen and I ended up going with the guy who actually brought up stuff that I hadn’t already thought of myself. (Like if you actually cook and use your kitchen, it’s useful to have counterspace adjacent to your stove…ie, sticking a stove in an island is about the worst place to put it unless you really have a huge island. My mother in law has a gorgeous kitchen that is magazine worthy, but it is SO poorly laid out. There are so many basic things that people should think through but don’t. I will plan on writing a post about it soon. I did actually post again to my blog after almost a year. ooh, we will have to check out your blog! Our kitchen also looks nice but isn’t a working kitchen. It is a very good entertaining kitchen– lots of warming lamps, a huge pantry (that was full of hard liquor when we first saw the house), big ice maker, etc. But not so much with workflow for chopping and cooking. And we’ll check to see if our town does have cabinet stores other than Home Depot. “Buy this look” is genius, I don’t know why that isn’t already available. Design articles that show staged rooms really ought to solicit ‘buy this look’ buttons from their advertisers. All of our huge windows have drapes – we asked the landlords to take out the vertical blinds before we moved in – except the kitchen. The kitchen has a big glass slider that opens onto the patio. I opted for light-maximizing simplicity in there with cling film that looks like ice crystals on one side. The other side is not directly overlooked by anything so I left it bare, aside from hanging some capiz shells to warn off the hummingbirds. Design articles really ought to! I can’t beleive no one has mentioned the HOUZZ app. It’s like flipping through thousands of magazine clippings all for free. In fact, my mudroom coat rack hutch thing was based on a clipping from that site. I am about to go there now looking for photos of bay window exterios now (which we are redoing and the contractor wants to know how to finish off the trim). I think I also got my idea to do my patio in brick from that site too. 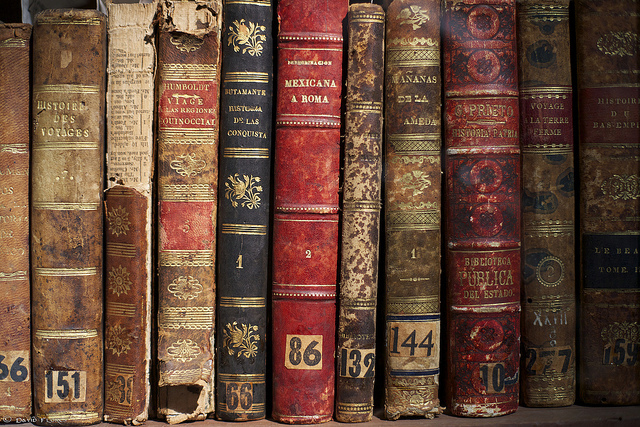 I have a period home so I actually have been going to the library to do research on what’s appropriate for that era home. I also use google images to get ideas. When I travelled a lot I used to buy loads of magazines but that gets pricey, so I’ve curved my habit to just one home delivery subscription. I do use online reviews a lot and they have been very helpful. I am trying to write more reviews myself as a way to pay it forward for others as well. I live in the northeast, so I don’t have to worry about blinds melting, so I went with a middle of the road one. Honestly I picked more based on color vs price. I figured they’d all be pretty nice relative to the $5 blinds I used to have. Sounds like good blinds are a must have in your region and they do look way better and double bonus points for the 20% coupon deal. 1050 *is* a lot of money. it is! But not in the world of home decor or repair. Our next step up after spending hundreds of dollars on energy-saving curtains was buying energy saving windows, and those were an order of magnitude more expensive. I still remember the first time we bought a new couch. We fought over it for years, because $400 is also a lot of money compared to the $15 we’d previously spent on a couch. But people buy couches that cost THOUSANDS of dollars. Many people! Normal people! People who make much less money than we do! This is why it takes us so long to do anything! Our couch also cost less than $400– though we bought an entire set at once and felt like we were hugely splurging, because yeah, we were spending like $1000 in one shopping trip. We don’t fight over these things, and once we decide to actually take the plunge we’re laser focused with research and actually buying and then we’re glad to have the entire ordeal over with. But there’s a lot (years!) of dithering before we decide to take a plunge. did I say the new window treatments are really pretty? Because they are. They look great. 1) I love the blinds!! No chance of melting, either. I also really would love to have decorator friends. I feel like I have OK taste, but no sense in how to put it all together and to use space well. 2) I have an ask the grumpies question. Or you can just respond very briefly here if that makes more sense. What is your opinion on umbrella insurance. I saw in one comment (I did search your blog) that at least one of you has it. Just curious. Short answer to umbrella insurance: get it if you have substantial assets someone could potentially take if someone pursued a frivolous lawsuit against you. $184/year for $1M seems reasonable. I’ll queue it up for a full answer though. Yeah, that was my thought – we may as well get it… but what qualifies as substantial? I guess we can only hope our assets will become increasingly substantial! Enough that someone would feel it was worth suing you for it! And enough that it would take you a while to build up again.